CONTINUING to invest heavily in the state-of-the-art Mori Seiki CNC machines, Hi-Force – the UK’s leading manufacturer and supplier of hydraulic tools – has recently manufactured the largest hydraulic cylinders to date. 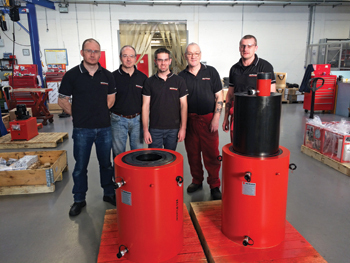 The build of two 500 tonne 8-inch hollow piston cylinders has been completed for Hi-Force UK’s distributor, HES Sales Ltd. The cylinders were designed by Hi-Force UK design engineer, Charlie Watts to meet the exact requirements of the end users. The other members of the Hi-Force manufacturing team responsible for the machining, building and testing of the completed jack were Neil Varney and Mick East (operators for the SL603), Colin Birch (senior assembly shop fitter) and Dave Cawton (assembly shop manager). Hi-Force offers an extensive product range from cylinders, pumps, torque tools, bolt tensioners, jacks, nut splitters, puller kits, crimpers and toughlift jacking systems. The industries it caters to include oil and gas, mining, petrochemicals and refining, ship building and ship repair, aerospace, defense, heavy engineering and thousands of industrial service companies supporting these industries. “Hi-Force is committed to manufacturing products of the highest quality and using the best machinery available to ensure that all products meet the most stringent quality requirements possible,” says a company spokesperson. The Hi-Force philosophy of offering a complete service package to support its customers’ needs and requirements extends to tool rentals, on-site services, repair and calibration and training. With such an extensive array of products within the Hi-Force range, many clients simply cannot justify the high capital outlay to purchase, especially in cases where their needs for the product are relatively short term or a one off job, explains the spokesperson. A comprehensive fleet of rental tools is maintained both at regional offices and at participating distributors worldwide. Hi-Force actively promotes its tools rental services package. All Hi-force offices worldwide, and many of its distributors operate a fully equipped workshop repair facility, using the latest repair, testing equipment and techniques carried out by trained and qualified workshop technicians. All Hi-Force service centres carry ample stocks of commonly used spare parts and are able to offer a guaranteed repair service for all Hi-Force products as well as most international competitor brand. Through training, years of experience and a motivated workforce, Hi-Force is able to offer on-site services that are second to none, says the spokesperson. Hi-Force is fully committed to improving levels of technical capability, both within its own workforce and also throughout its expansive distributor network. It continues to invest considerable efforts in the establishment of first class technical sales and service training courses for both sales teams and end users. Hi-Force is approved by the ECITB (Engineering Construction Industry Training Board) for the provision of Mechanical Joint Integrity (MJI) training courses in line with industry standards and practices. With many years of hands-on experience in the oil, gas and petrochemical industries, as well as power generation and construction, Hi-Force’s ECITB approved trainers have the technical and practical knowledge and understanding to deliver the accredited training courses. Courses are held on a regular basis and are carried out in ECITB approved training schools located in the UK and the Middle East, with additional ECITB approved training schools being set up in Malaysia and South Africa later this year. With over 30 years of hydraulic tool manufacturing and technical sales experience in place, Hi-Force is certainly a company that can be trusted with current and future hydraulic tool demands.